The ZTechnik® License Plate Bracket Helmet Locks for BMW motorcycles use the easily accessible license plate bracket to provide leave-behind security for two full-face helmets. 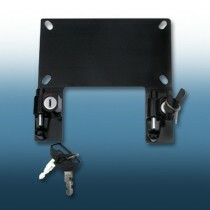 A sturdy push-lock mechanism accepts two D-ring or similar helmet closures. Fits all U.S. models. Also fits Canadian and Australian models. NOTE: Fitment of Wisconsin plates to the Z5505A is marginal because the state of Wisconsin does not comply with SAE license plate standards. Wisconsin plates may be mounted but only the top two holes will match the plates. 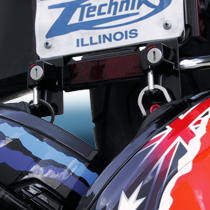 The ZTechnik® License Plate Bracket Helmet Locks for BMW motorcycles use the easily accessible license plate bracket to provide leave-behind security for two full-face helmets. A sturdy push-lock mechanism accepts two D-ring or similar helmet closures. Slip the D-ring behind the lock bar and push the lock shut. Simply use your key to unlock the helmets when it's time to go. 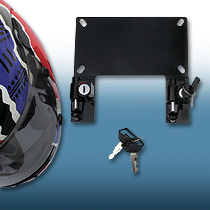 The License Plate Bracket Helmet Lock is made from high strength steel with black powdercoat, and is furnished with two matched keys. Item Z5505A fits all USA, Canadian and Australian license plates. Item Z5506 fits all Japanese license plates. Note: Because the State of Wisconsin does not comply with SAE license plate standards, fitment of Wisconsin plates to the Z5505A is marginal. Wisconsin plates may be mounted, however only the top two holes will match the plates.